Leaf-cutter ants and fungus gardens. Researchers at PNNL analyzed metaproteomic data previously generated from fungus gardens to identify shifts in microbial physiology that corresponded to their metabolomic observations. This image is protected by the Creative Commons Attribution License (http://creativecommons.org/licenses/by/3.0/) Photo by Austin Lynch. Results: A team from Pacific Northwest National Laboratory and the Great Lakes Bioenergy Research Center is using metabolomic and metaproteomic techniques to examine the dynamics of nutrient turnover in the gardens of leaf-cutter ants. These herbivores, which are found in ecosystems throughout the Neotropics, feed on fungus gardens cultivated on fresh foliar biomass. The team found that numerous free amino acids and sugars are depleted throughout the process of biomass degradation, indicating that easily accessible nutrients from plant material are readily consumed by microbes in these ecosystems. Accumulation of cellobiose and lignin derivatives near the end of the degradation process supports the research team's previous characterization of lignocellulases produced by the fungal cultivar of the ants. Their results also suggest that derivatives of urea may be an important source of nitrogen in fungus gardens, especially during nitrogen-limiting conditions. No protein-free arginine ("free" arginine) was detected in the team's metabolomic experiments, despite evidence that the host ants cannot produce this amino acid, which is a key nutrient for the ants. This suggests that biosynthesis of this metabolite may be tightly regulated in fungus gardens. These results provide new insights into microbial community-level processes that underlie this important ant-fungus symbiosis. "Although recent investigations have shed light on how plant biomass is degraded as it moves through the strata of fungus gardens, the goal of this study was to gain insight into the cycling of nutrients that takes place in these specialized microbial ecosystems," said Dr. Kristin Burnum-Johnson, a PNNL biochemist and co-author of a research paper that will appear in Environmental Microbiology Reports. Why It Matters: Investigating metabolic transitions and biomass degradation in the ants' cultivated fungus gardens yields important information about how these insects influence terrestrial nutrient cycles. The findings show that metabolomics can be a useful tool for understanding nutrient dynamics in microbial ecosystems and disentangling the complex molecular details that underlie multispecies associations. 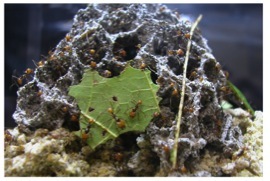 Methods: To identify metabolites with a significant change in abundance between strata, the research team sampled the top and bottom sections of fungus gardens from laboratory-reared Atta cephalotes ant colonies fed a combination of oak and maple leaves. Then, the researchers analyzed metaproteomic data previously generated from fungus gardens to identify shifts in microbial physiology that corresponded to their metabolomic observations. What's Next? Future work elucidating the extent of variation in metabolite profiles in gardens of wild A. cephalotes colonies would provide important insights into the consistency of the biomass degradation process in leaf-cutter ants. Sponsors: The work was funded by the U.S. Department of Energy's (DOE) Office of Biological and Environmental Research (BER), under PNNL's Pan-omics Program, and performed in EMSL, a DOE-BER national scientific user facility located at PNNL. This work also was supported by the DOE Great Lakes Bioenergy Research Center. Research Team: Eric Huang, Kristin Burnum-Johnson, Young-Mo Kim, Bobbie-Jo Webb-Robertson, Carrie Nicora, Zeping Hu, Thomas Metz, Mary Lipton, and Richard D. Smith, PNNL; and Frank Aylward and Cameron Currie, University of Wisconsin-Madison. Reference: Huang EL, FO Aylward, YM Kim, BJM Webb-Robertson, CD Nicora, Z Hu, TO Metz, MS Lipton, RD Smith, CR Currie, and KE Burnum-Johnson. 2014. "The Fungus Gardens of Leaf-cutter Ants Undergo a Distinct Physiological Transition During Biomass Degradation in Fungus Gardens." Environmental Microbiology Reports 6(4):389–395. DOI: 10.1111/1758-2229.12163.